Frontier Corps (FC) (North) Jobs 2019 for 100+ Works and NCSE Staff (Middle / Matric) to be filled immediately. 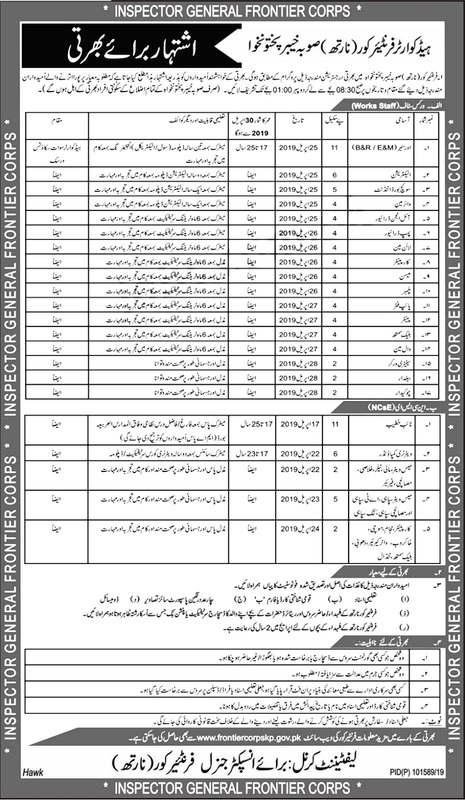 Frontier Corps (FC) (North) Jobs 2019 for 100+ Works and NCSE Staff (Middle / Matric) to be filled immediately. Required qualification from a recognized institution and relevant work experience requirement are as following. Only short listed candidates will be invited for interview and the selection process. Last date to apply to the post and submit application along with required documents is 28th April 2019.